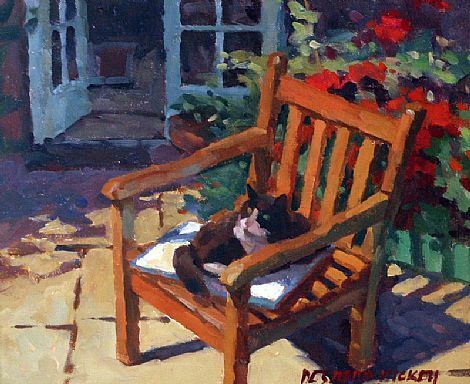 Desmond Hickey attended the National College of Art and Design during the late 1970s and early 1980s. His tutors during this period were John Coyle RHA and Des Carrick RHA. Yet he is mostly self-taught. He received private tuition under Henry Healy RHA during five years and Healy had an influence on the way he approached his work. For the large part the 19th century French painters, the impressionists, influenced Hickey. He also appreciates the Fauvist school’s subjective and expressive use of colour, and Picasso for his approach to subject matter. In the Irish school a number of painters also inspired him notably William Orpen, William Leech and Roderic O’Connor. Location and place also has influenced the way in which he paints – in Ireland he attempts to capture the rapid changes of light and in France, the steadier conditions of calmer surroundings. The actual act of painting inspires him; he says “making a painter’s representation of a subject involves a transformation from the ‘real’ object to a painter’s counterpart. In the process one uses visual language and experiences many nuances concerning the way paint works in and of itself” . Subject matter is less important than painting itself due to the problems and opportunities the actual act of painting presents to the artist. Any one painting is a constant challenge, an intriguing education and an explorative tool in looking at the relationships between light and shade and warm and cold. Generally working in front of the subject matter, his work ranges broadly from landscape, still life, interior domestic scenes and figurative works. Each of his paintings is engaged by the problem of expressing the unique visual character of the subject associated with a particular short period of time. His work illustrate a means of exploring, uncovering and recording visual relationships in the visual world as distinct from the narrative of message painting Yet Hickey’s major concern is “the manipulation of the paint itself”. He says “When the opportunity presents itself I like to make a joke or some subtle comment or insert some sense of a wider context – for example, in still life, by the combination of objects chosen for the design I sometimes use picture titles to nudge the viewer towards a particular way of viewing the painting” . Like many of his contemporaries he uses photography as a research tool in his approach to his narrative work. His preferred medium is oil due to its smell, plasticity, and the way it mixes. He also says that he likes how “it can be manipulated, how it permits use of fingers as painting tools. I like how it looks when it is dries and how it retains information about how a mark is made” Desmond Hickey’s style shows the use of broken colour though loose, expressive brushwork. He is preoccupied with the broad relationships in artistic practice – the relationships between tone, colour, temperature, light and dark. His work is an expression of personal qualities, reflecting what is familiar to him and what surrounds him. Yet too, it is historical derived from French late 19th century painting. One of Ireland’s plein air painters when the opportunity arises he readily works out of doors, working alla prima and directly applying the paint onto the canvas. Yet so too does he work from studio touching up details or working from sketches. Hickey’s work looks to colour, tone, and the act of painting in its own right. His inspiration comes from what he discovered in his own painting rather than from his subject matter. There is a directness and spontaneity in the final appearance of his works, which rejoice his fresh approach and inspiring ideas.